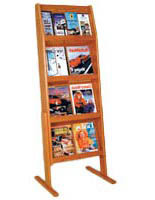 These magazine holders that help sell various periodicals and publications are made of wood. 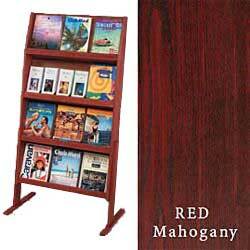 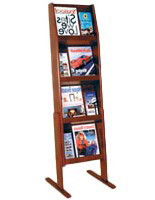 The traditional design of the displays has red mahogany finish that makes any environment look upscale. 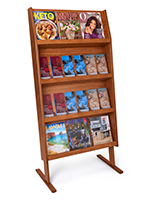 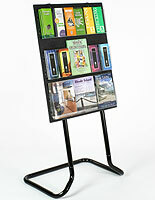 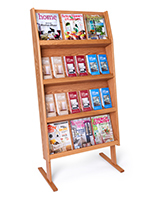 The magazine holders are commonly placed in visitors' centers, waiting areas, lobbies, and retail sales departments. 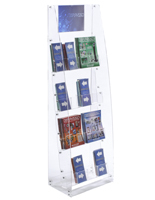 The book store displays are open in the front yet feature an angled layout that keeps literature properly exhibited. 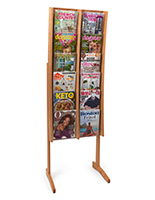 Each of the magazine holders is sold with a set of removable dividers to accommodate either 4"w brochures or 8-1/2" x 11" printed materials.